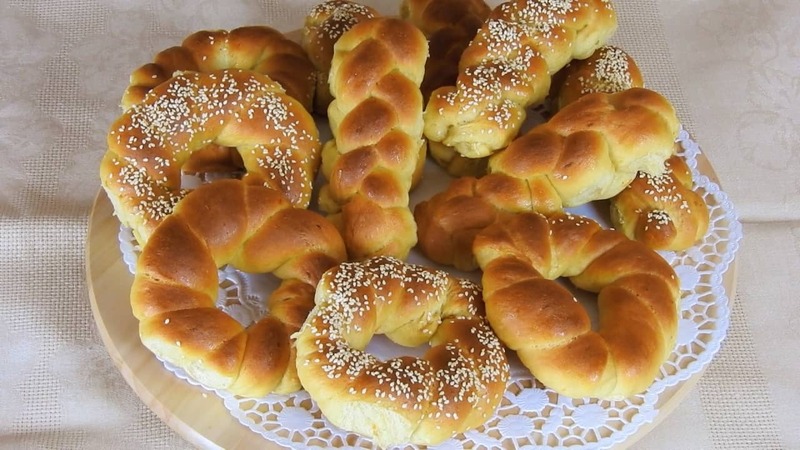 The traditional Greek sweet bread without eggs and butter. The dough is made with fresh orange juice and extra virgin olive oil, which makes it ideal for fasting periods and for those who choose to (or should) follow a healthier diet. Enjoy! Add 1tsp of the measured sugar and the warm water to the yeast. Mix well. In a large bowl combine the sugar with the orange juice. Mix until the sugar dissolves. Mix in the tahini and half of the olive oil. Add the orange zest and the yeast mixture. Whisk well. Combine the flour with the two spices. Add about half of the flour and whisk until it’s completely incorporated. Gradually add the rest of the flour and start mixing with your hand. Add the remaining olive oil and start kneading. Knead for about 10 min until you have a smooth dough. Oil the bowl and the dough and cover with plastic wrap. Place it in a warm spot and allow to rise for 90 min. Brush your working bench with olive oil. Take the dough out of the bowl and press gently to deflate it. Weigh the dough and cut it into 12 equal pieces. Smooth them under your palm and cover with plastic. It’s time to shape your buns into any shape you like. Brush their tops lightly with olive oil. Cover with plastic wrap and allow to rise for another 30 to 40min. Mix honey with water and brush the buns gently. Bake in a preheated oven, at 180⁰C for 20 to 22 min until they’re golden brown. Transfer onto a wire rack until they’re completely cool.